How to make holiday every week! Like I’ve said before supervising children, school run, chores, etc etc can become VERY repetitive. 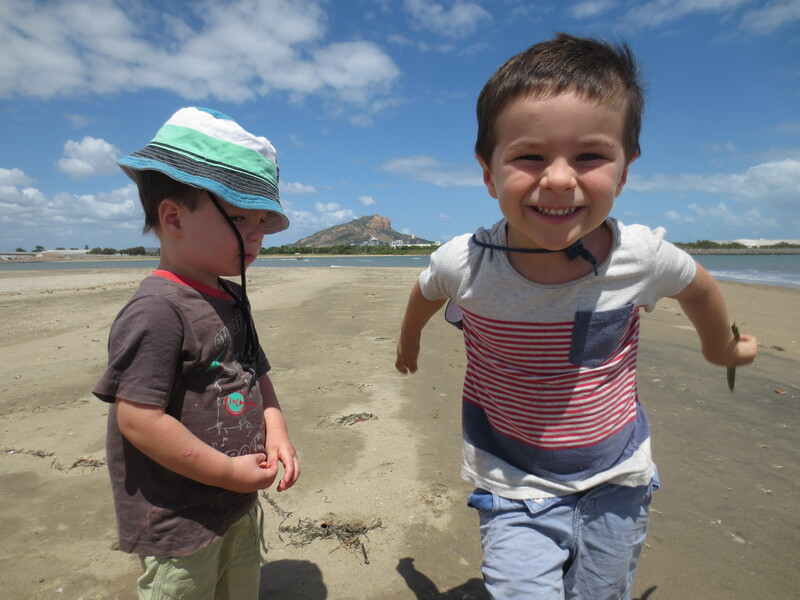 To combat this problem we have family “Adventures” and we call them that, the kids like it. I don’t want my weeks and months run by appointments and schedules, be here at this time or do this then. I love freedom and spontaneity in my weekends and sometimes my weekdays, I have often dropped my eldest off to school and driven an hour to spend the day at my all time favourite place Davies Creek with the younger two. I take tea, biscuits, fruit and sandwiches and we are set. 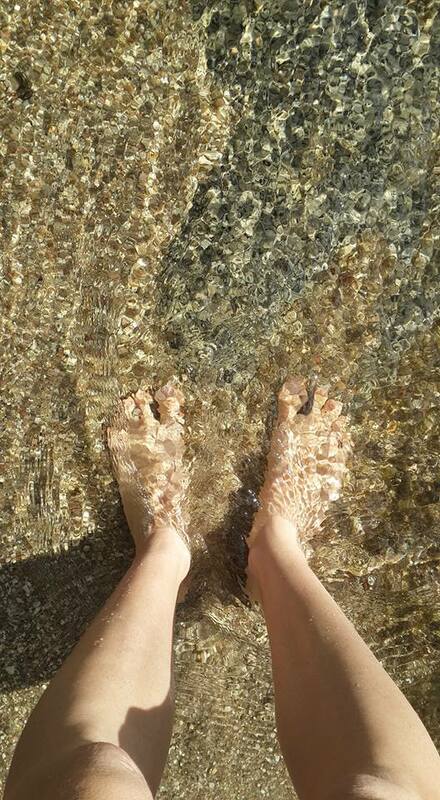 When I’m here outside, surrounded by trees, running water, the wind blowing my hair about, walking through the shallows and feeling the river sand between my toes… stuff doesn’t matter anymore. I’ll be the first one to admit, I find being a mum hard, yes I do. I love it, I wanted it and still want it, but its hard for me and I never would’ve of imagined it being this hard. I’ll talk more about that another time, in this post I want to share with you one way that helps me feel peace and joy, and its free. Outdoors! At the very least just spending an hour in the garden, with the sun on me and dirt under my finger nails is enough to lift my spirits…. (as I’m writing this I can see Claude (rooster) on the watch for Mr Goanna who I just had to chase away from the chook pen) … Sometimes I take off all day, driving up to the tablelands and visiting my favourite spots. Don’t just do these things on “holidays” make it feel like holidays as much as possible I say. So many options, beach, creeks, botanical gardens, have a picnic in your garden, go to your local markets and have a coffee, lay in the sun (yeah to hell with sun safety for 10mins!) do you know how good vitamin D is for your mood? When was the last time you got sweaty? I actually love the feeling you get after a good sweat… no not at the gym (boring) just move around doing something outdoors. We are not supposed to be indoors this much. Even writing this I feel the urge to leave my computer. 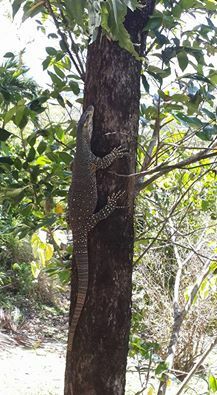 Mr Goanna is now up a tree. You know what’s also awesome about “Adventures” is that there are no toys to throw around, no mess to clean up. They drop some crumbs on the ground or spill a drink, no biggy, your outside! I find myself having more fun with my boys when I’m outdoors, because there is nothing else I have to do but be with them. And when we get home they are pooped and usually sleep really well if having an afternoon nap or they doze off and sleep the car ride home. And you can relax feeling full of love and life. Have just read all 3 of your blogs. Very good. Enjoyed the content. Good to hear you like living on the hill. Loved the photo of the goanna. Curious to know is the photo current ?